Every child deserves the chance to discover their talents and prosper. Families First of Minnesota believes this is true and provides resources to family members, guardians, and providers to find care options and help prepare children for school. Through programs such as Head Start and School Readiness, Families First is helping families throughout their community to help make children’s live more enriching going into and throughout childhood. Families First of Minnesota has touched so many families’ lives and we are very happy to have been able to work with them. The old Families First website had so many great resources and pages with information for families to use. However, with so much information, it was difficult to know where to find everything on the website. Our team updated the navigation and reorganized the website to help highlight the resources that Families First of Minnesota has to offer. With the new layout, navigation is a breeze and it is much easier for staff to make changes to the site. As a non-profit organization, donations are an important part of Families First. Our team helped promote donations with a prominent donate button in the menu bar and by creating strong calls to action throughout the website. Vision Design also refreshed the organization’s logo and updated the website for desktop and mobile capabilities. 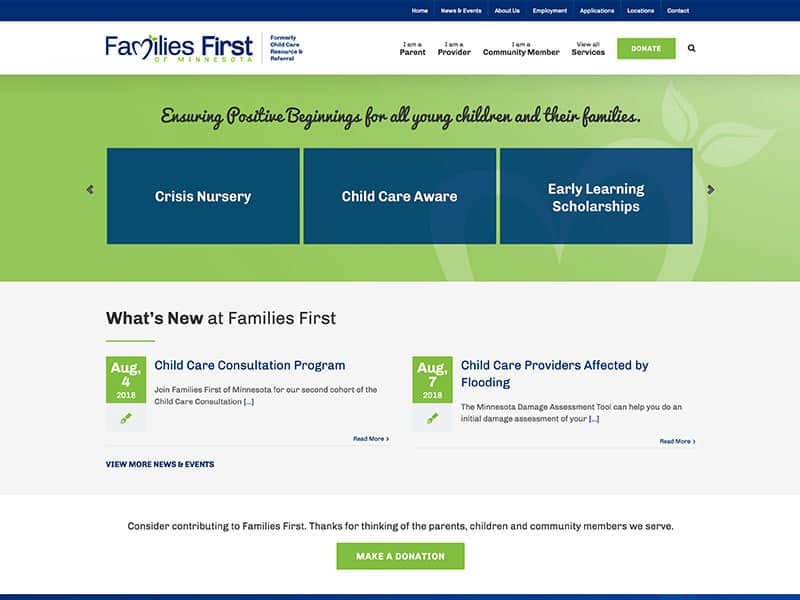 Click here to check out the new Families First of Minnesota website! Contact us today if it is time for an update to your website!